Quizziz is an online assessment tool that allows to teachers and students to create and use one another’s quizzes. After providing students with a unique access code, a quiz can be recorded live as a timed competition or used as a homework with a specific deadline. After the quizzes have been completed, students can review their answers. Furthermore, the resulting data is compiled into a spreadsheet to give the instructor a clear visual of the students’ performance in order to analyze trends in which areas might need the most focus in the future. This immediate feedback can be used by teachers to revise future learning activities and altar the focus of material by putting a larger emphasis on concepts that students are struggling with. 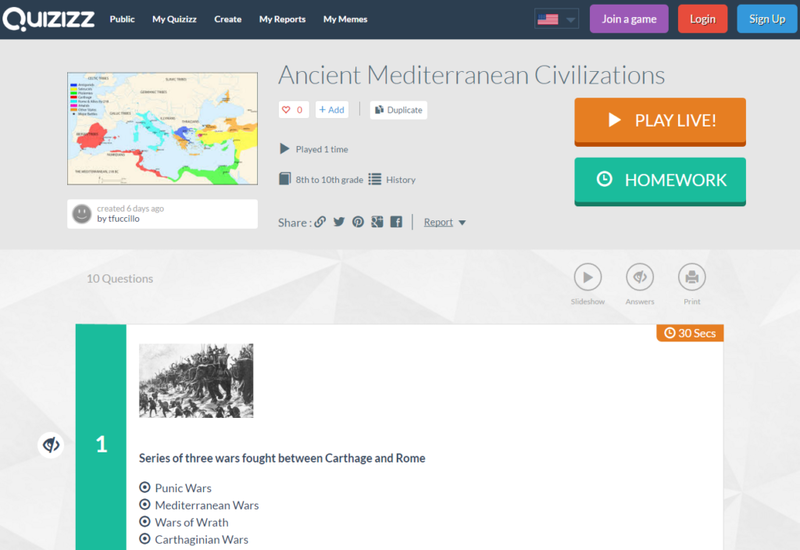 Ease of Use & Access: Quizizz has a very straightforward layout and the site does a great job of walking you through the quiz-making process step by step, so as not to overwhelm the user. Taking the quizzes themselves is also extremely intuitive. Once the students have entered the access code, all there is to do is select an answer to the questions as they appear. It’s also worth noting that the quizzes can be accessed on any device with a web browser. Joining the site is completely free; there are actually no paid features on Quizizz. This tool does lack in accessibility, however. It doesn’t provide any modifications to allow students with visual impairments to participate in the quizzes. Substitution: Students take an online quiz on Quizizz rather than on a piece of paper. Augmentation: As they take the quiz, the students can see how their responses compare to the rest of the class while remaining anonymous. Modification: The students are able to review their responses immediately while still fresh in their minds rather than having to wait for a teacher to grade each individually. Redefinition: The instructor reviews the trends in the class’s data (i.e. which problems took students longest to answer, which questions the most students got wrong, etc.) and uses these results to determine which topics need further attention. A quiz could be created addressing almost any topic. Go to Quizizz.com and hit “GET STARTED”. If you want to use an existing quiz, you can use the “Search for quizzes” box and browse. Once you have selected a quiz, skip to step 8. If you want to create your own quiz, select the “Create” panel, then the “Sign Up” panel and fill in the form. Enter a name for the quiz and an image if you like. You can also select its language and make it either public or private. Fill in a question, as well as answers, and be sure to click the “incorrect” icon next to the correct answer in order to change it to “correct”. You can also add a corresponding image if you would like. Select “+ New Question” and repeat step 4. Do this until you have made all of your questions. Hit “Finish” in the top right corner. Select the appropriate grade range, subject(s), and topic(s). You can also add tags to make it easier to search for. You can either select “PLAY LIVE!” or “HOMEWORK” and choose the desired attributes. Students can go to Quizizz.com/join and type in the 6-digit code to participate in the live quiz or complete the homework. They will be asked to enter a name to be identified by. Once the students are finished, refresh your page and you will be able to view the results of the quiz. Click the “+” next to a name to expand and get more detailed, question-by-question results.